Port of Houston’s new cranes can move a loaded container twice as fast as their predecessors. Port of Houston’s new cranes extend 22 containers wide, compared to 13 container-wide reach of older cranes. Houston’s new cranes will increase the port’s productivity and allow the port to unload larger vessels. The Port of Houston Authority has commissioned the first of four new Super Post-Panamax STS cranes at its Barbours Cut Container Terminal. The four electric, semi-automated ship-to-shore cranes arrived at the port last May. Each of the structures looms as tall as a 30-story building, are the largest ever constructed by South Korea-based Konecranes, and currently stand taller than any other marine cranes in North America. 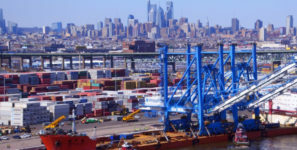 The new cranes “can move a loaded container twice as fast as their predecessors and will bring our Barbours Cut terminal capacity from 1.25 million TEUs [20-foot equivalent unit] to 2.5 million TEUs,” said Port Authority Executive Director Roger Guenther. With a 65-long ton capacity and the ability to handle two 20-foot containers simultaneously, the cranes’ capacity increases to 80 long tons with use of a cargo hook. The massive cranes extend 22 containers wide, compared to the 13 container-wide reach of the older cranes, giving them the ability to load and discharge the latest generation of megaships of up to 14,000 TEU capacity. The four cranes were ordered in May 2013 along with three RTG (Rubber Tired Gantry) cranes for a total price tag of $56 million.